Sometimes I just want to make something cute and inexpensive. Sometimes I also just want to try out a new tool and have some fun. 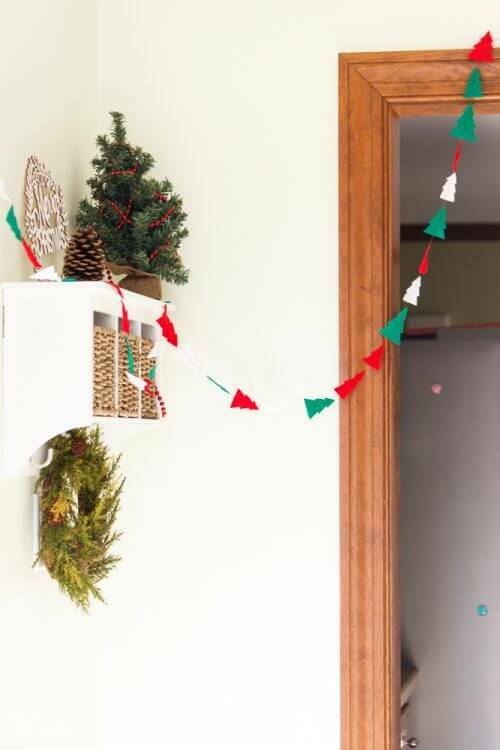 For this DIY Christmas Garland, I combined both the making of something cute and inexpensive with the trying a new tool and having fun. Felt is so stinkin' inexpensive. It makes it a great vehicle to have some fun with and not worry too much if things don't work out like you want. I recently got the new Cricut Maker. Oh la la! I had heard that it would cut felt really well and knew I needed to give it a try. So, I came up with the idea to create a simple Christmas tree garland using the Cricut Maker and some felt. 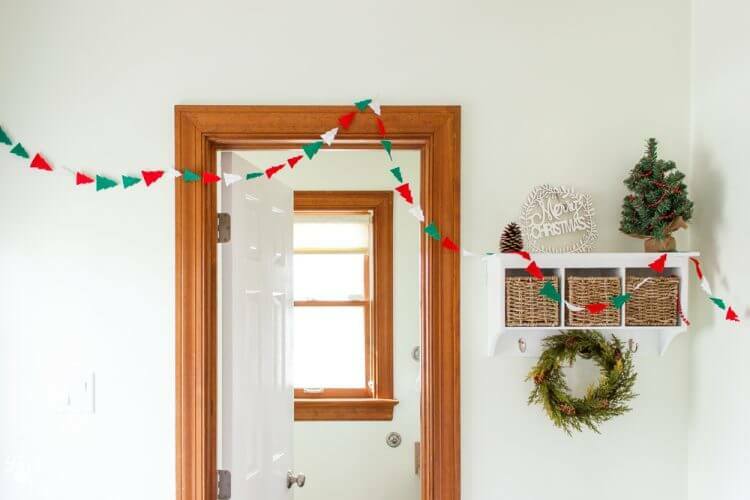 The end result is this simple DIY Christmas Garland. At the bottom of this post, I have a link to my cut file. You will start by cutting out the trees from your felt. Plan on this taking some time. It took me about 15 minutes per piece for the larger trees and 20 minutes for the smaller trees. The Cricut Maker can in fact cut felt really well. However, I think because of the angles of the trees, the Design space recommended the deep cut housing blade for cutting these trees out. It didn't work. I manually changed it to the rotary blade. You will need to manually change the settings before you begin cutting to use the rotary blade. The rotary blade is wonderful! It did a great job cutting out the trees, but I think because of the angles of the trees, it took quite a bit of time. I wasn't terribly thrilled about it, but I wanted to make the garland, so I just turned the Cricut on and went about doing other things while it cut out the trees. 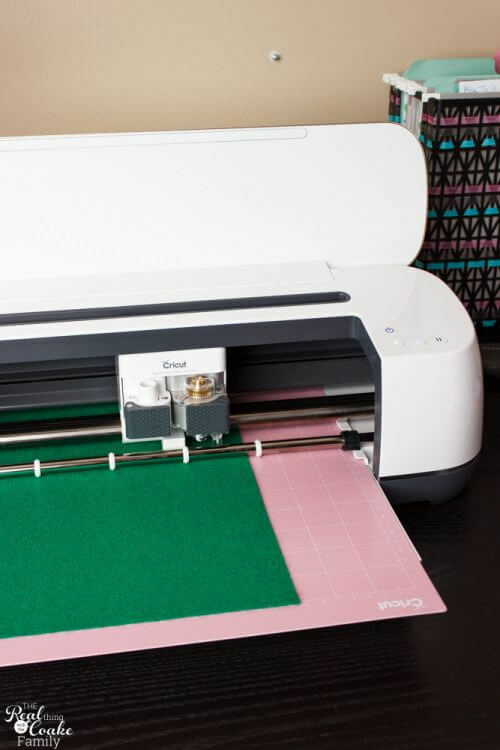 Here is a video showing the process and giving you some Cricut Maker tips. Once you have all the trees cut out, you will sew them together. 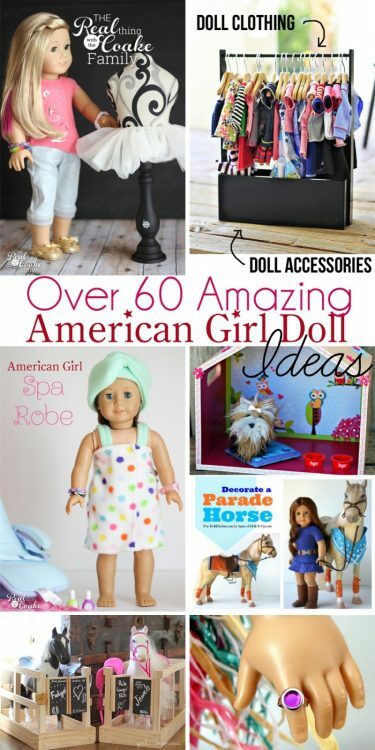 Create the color pattern you like and start sewing. It is pretty easy and quick. You will want to leave a little bit of space in between each tree. I was not precise with this, just randomly added trees. 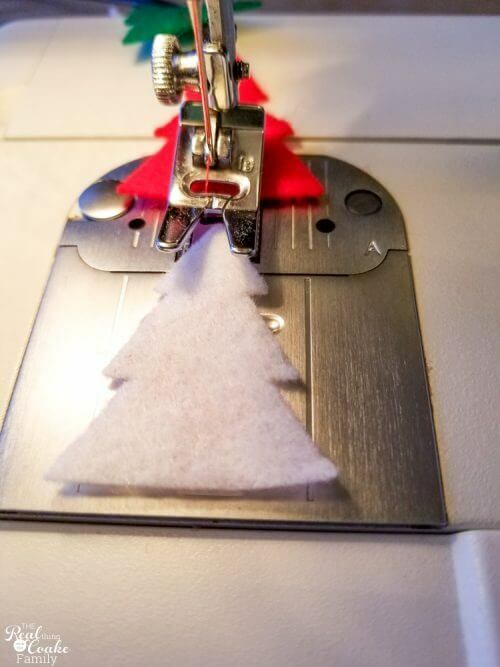 The top of the trees will get a bit stuck if you load them into the sewing machine right at the top of the tree. 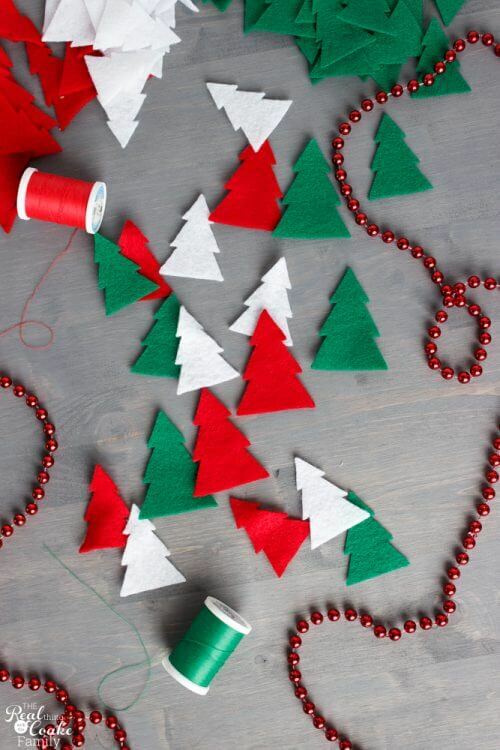 So rather than load them like you see pictured above, slide them up a bit and start sewing a bit down the tree. Showing the tree slid up just a bit. 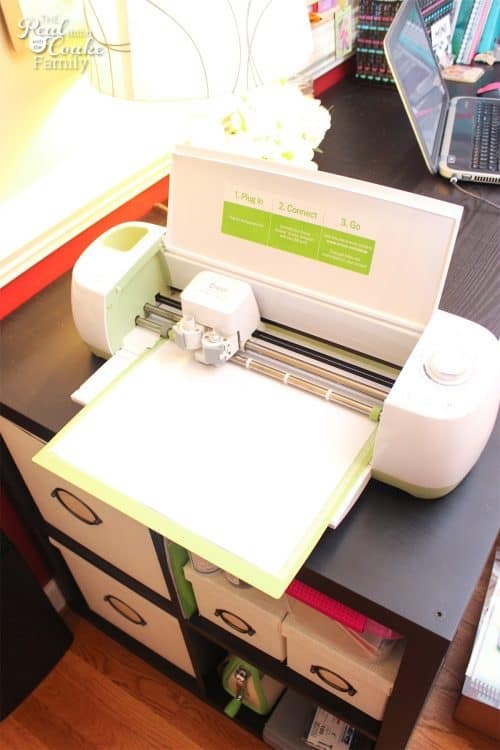 Start sewing here. Alternatively, you could sew your garland in the opposite direction and sew from the bottom of the tree to the top. That's it! I told you it was easy. 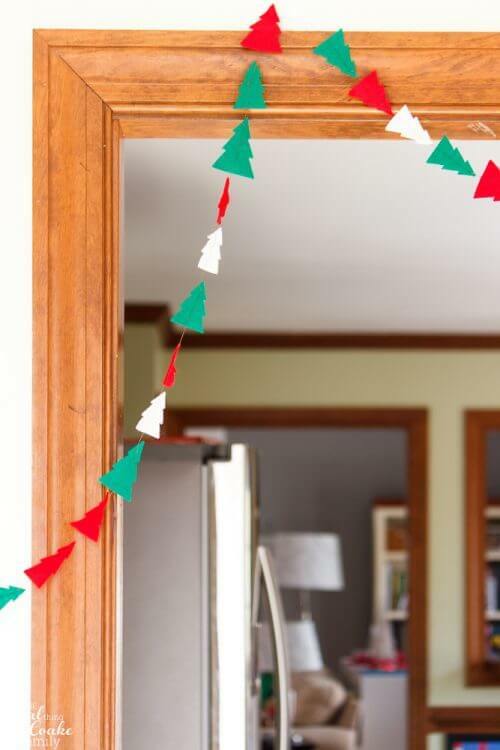 Now, you have a cute Christmas tree garland that you can hang wherever you like in your home. I was trying to figure out where it would look cute in my home when my youngest daughter suggested that I hang ours in our side entry. 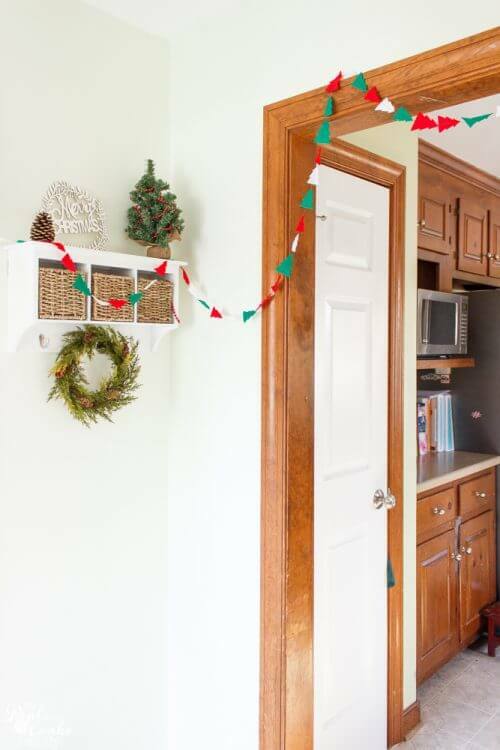 It makes for a cute entry to our house and since this is the entrance that we use as well as most of our friends use, it adds Christmas cheer to our entering and leaving our home. I normally hang my purses here on the hooks where you can see the wreath, so until Christmas is over, I will have to get used to leaving them somewhere else because the garland, wreath, and tree look so cute here. I was able to make enough to almost circle the entryway. Not quite, but close enough that the dogs got some Christmas cheer as well. 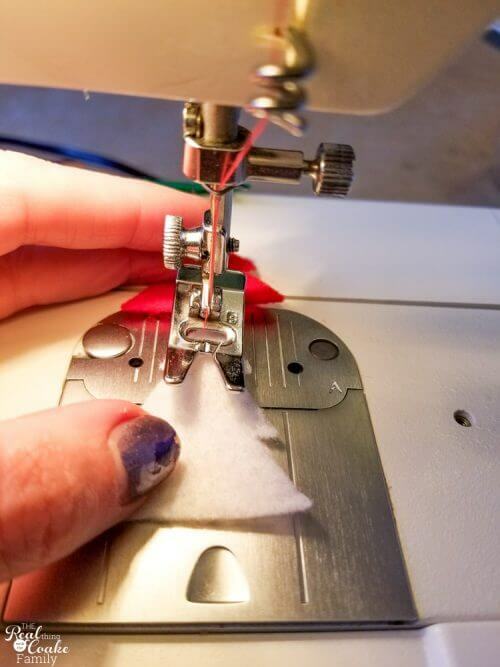 If you choose to give this craft a try and you use the same number of sheets of felt as I did, I would allow about 1 1/2 hours for the cutting. I know that is a lot, but thankfully, you can just set it cutting and walk away. 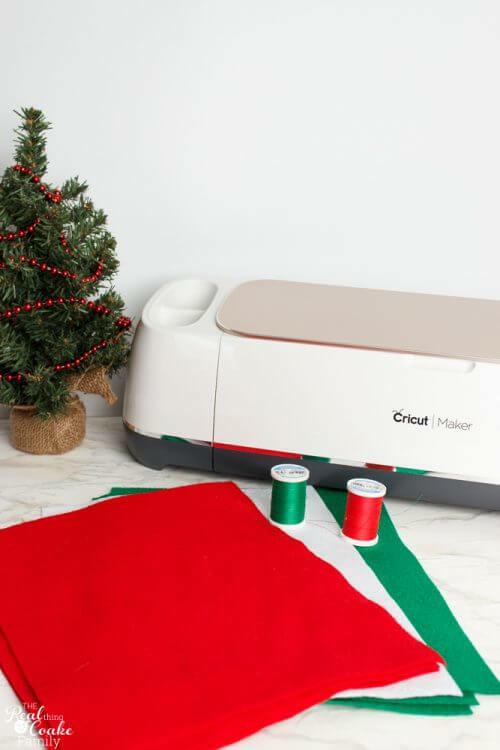 Then it will probably take you about 30+ minutes to sew the garland together. I never really keep track of the time, so that is a guess. 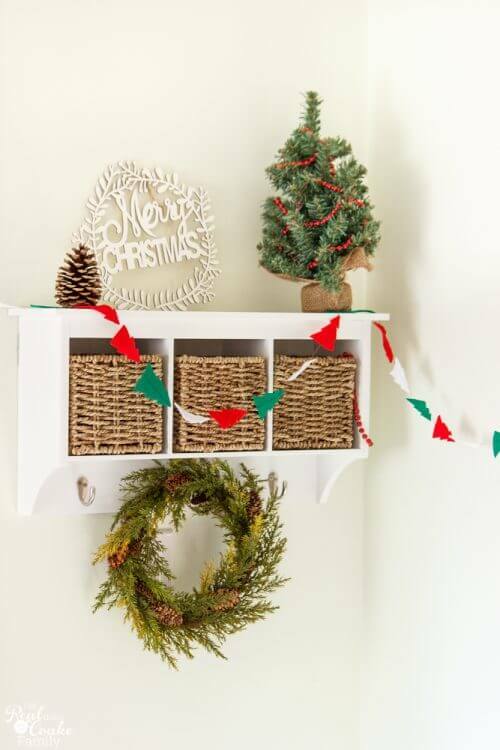 In the end, you will have an adorable DIY Christmas garland that would look cute in an entry, like mine, or on the stairs or even on the tree itself. There is also this fun pom pom and popcorn garland. 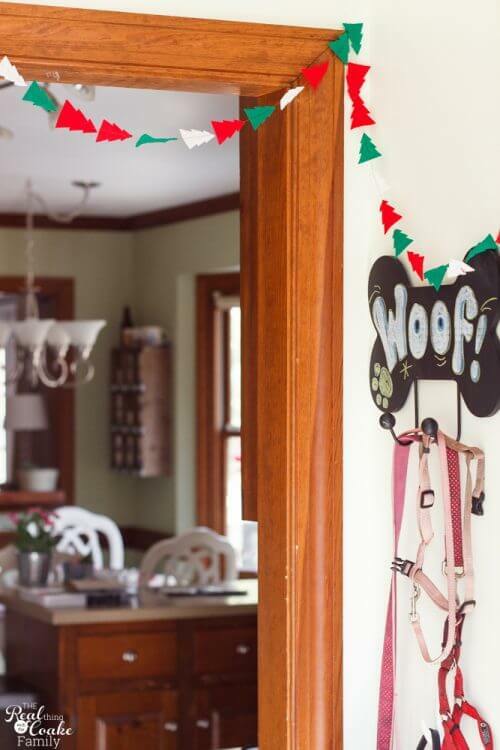 It is perfect for letting the kids help you and having a little family fun if you need another garland idea. Just sign in below to get my cut file for the trees. This garland is so adorable! 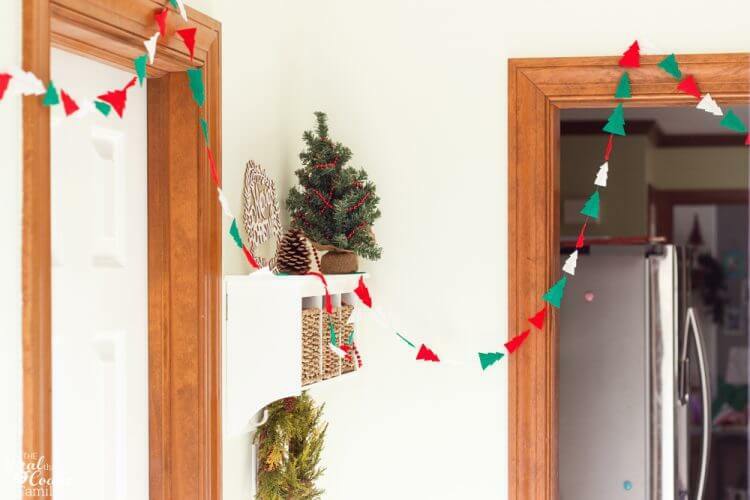 Even though Christmas has passed already, I’ll use this method to make a similar garland. Thanks! Thank you! I totally agree and thought about making one for Valentine’s Day, but ran short on time. What Holiday do you plan to make yours for?